From water waves to light waves. So far, we have learned that the particle theory and the wave theory of light both predict the observed phenomena's of. 2 So far, we have learned that the particle theory and the wave theory of light both predict the observed phenomena's of light. However, as we saw, neither theory could account for all observed phenomenons. So, for more than 100 years, both remained in conflict until Thomas Youngs double slit experiment. 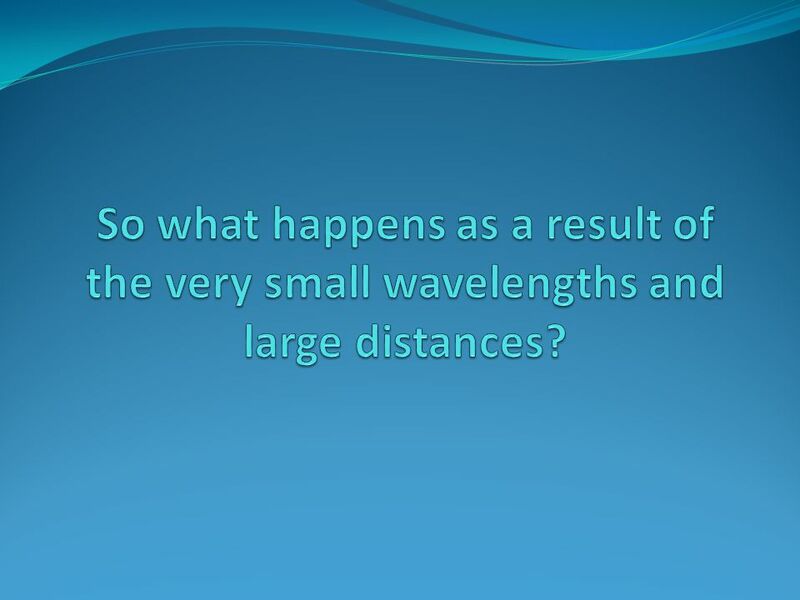 What was not known during Newtons and Huygens time was how small the wavelength of light really was. However, during Youngs time this was better understood. As such, Young used this knowledge to construct a better experimental apparatus that could show that light did in fact behave like a wave. 3 Conclusion: Light is a Wave! 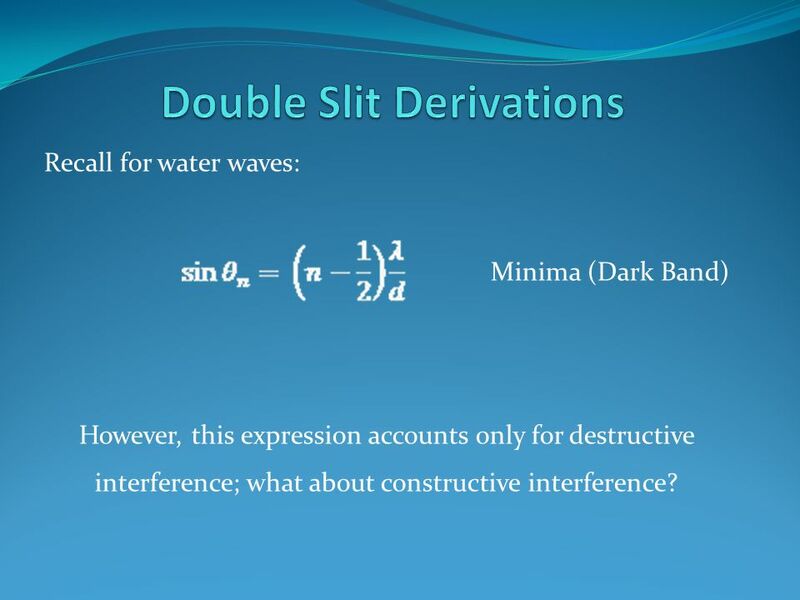 4 Recall for water waves: Minima (Dark Band) However, this expression accounts only for destructive interference; what about constructive interference? 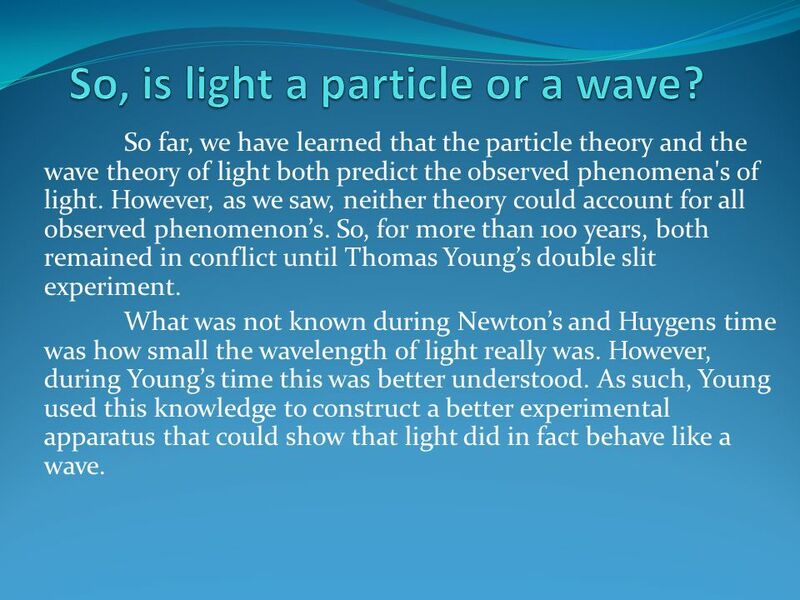 Download ppt "From water waves to light waves. So far, we have learned that the particle theory and the wave theory of light both predict the observed phenomena's of." Wave Nature of Light  Refraction  Interference  Young’s double slit experiment  Diffraction  Single slit diffraction  Diffraction grating. 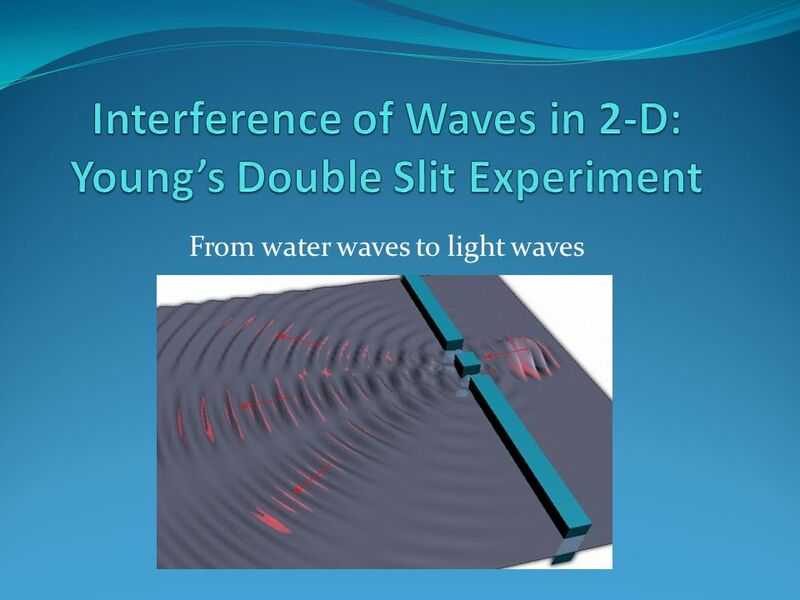 AP Physics Mr. Jean March 22th, The plan: –Wave interference –Double Slit patterns –Check out chapter #24 Giancoli.  At the time theories regarding light were being developed, scientists knew that light:  Refracted  Travels in a straight line  Reflects. CHAPTER 24 THE WAVE NATURE OF LIGHT. Huygen's principle, which states that all points along a wave front act as if they were point sources. Thus, when. When wavefronts pass through a narrow slit they spread out. This effect is called diffraction. 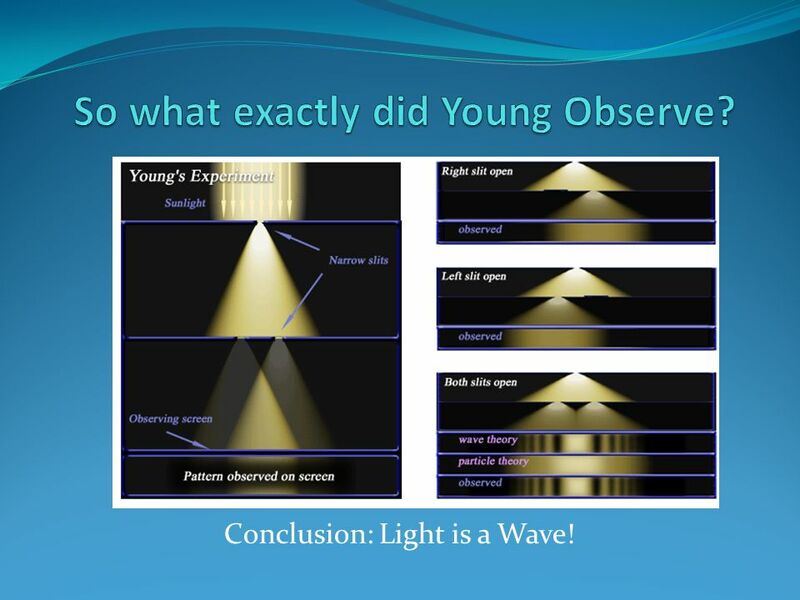 Young’s Interference Experiment In 1801, Thomas Young demonstrated the wave nature of light by showing that it produced interference effects he measured. R.G. The Professional Development Service for Teachers is funded by the Department of Education and Skills under the National Development Plan Some properties. Baby-Quiz 1.Why is the diamond more brilliant than a clear piece of glass having the same shape? 2.A surface appear yellow under the white light. How it. What is Light?. What is light? We can not understand what light is by examining light under microscope. We have to make whether it explains the observed. Phys 102 – Lecture 22 Interference 1. 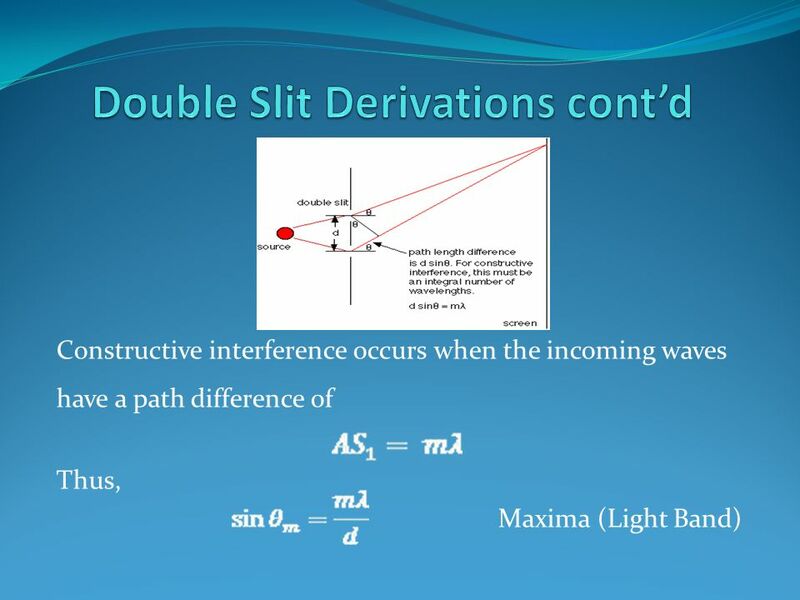 Physics 102 lectures on light Lecture 15 – EM waves Lecture 16 – Polarization Lecture 22 & 23 – Interference & diffraction. The wave nature of light Physics Department, New York City College of Technology. Interference Physics 202 Professor Lee Carkner Lecture 24. General Physics 2Light as a Wave1 The Nature of Light When studying geometric optics, we used a ray model to describe the behavior of light. A wave model. Physics 102: Lecture 20, Slide 1 Hour Exam 3 Monday, Apr. 18 (two weeks from today!) –Lectures 14 – 21 –Homework through HW 11 –Discussions through Disc.